A nice article for configuring email router with Hotmail accounts. Once , Microsoft Dynamics CRM 2011 E-mail Router installation is done successfully as per the post , it is time to have the router configurations done. ** Here the post talks about an online CRM instance where the users are the having windows live id which are Hotmail emails. Other mails work as well, provided you provide the basic pop and SMTP information correctly. 1. Have the MS CRM Users configured correctly. – Make sure their primary email is right. 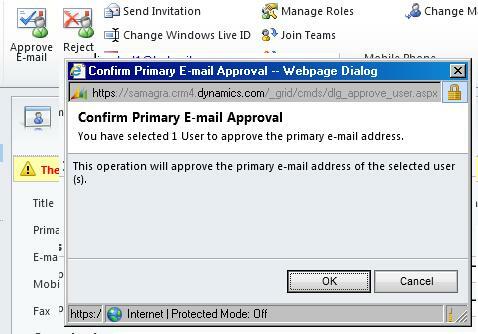 – Email Access Configuration needs to be set to Email Router. Default is usually Outlook. – Approve the user’s email. 3. Start the E-mail Router Configuration Manager. 4. Click Configuration Profiles and then click New. 5.Create a new Outgoing Profile with details as shown in the pic below. This one is for Hotmail emails. Previous Previous post: Microsoft.Crm.Application.Outlook.ConfigWizard.exe “The process was terminated due to an unhandled exception” error while running Configuration Wizard of Microsoft Dynamics CRM for Outlook.